We present a novel approach to real-time structured light range scanning. After an analysis of the underlying assumptions of existing structured light techniques, we derive a new set of illumination patterns based on coding the boundaries between projected stripes. These stripe boundary codes allow range scanning of moving objects, with only modest assumptions about scene continuity and reflectance. We describe an implementation that integrates these new codes with real-time algorithms for tracking stripe boundaries and determining depths. Our system uses a standard video camera and DLP projector, and produces dense range images at 60 Hz with 100 um accuracy over a 10 cm working volume. 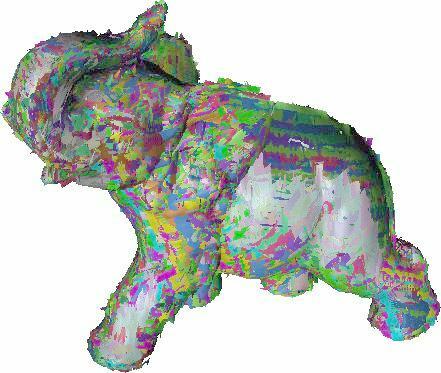 As an application, we demonstrate the creation of complete models of rigid objects: the objects are rotated in front of the scanner by hand, and successive range images are automatically aligned. Full paper as PDF, 499898 bytes.